Newton Gwanangura was born on the 11th July 1980. 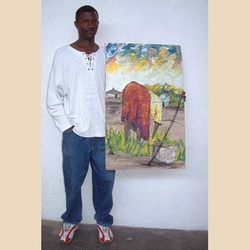 Completed his Olevels at Kuwadzana High School then went on to Alevels at Peoples College and then furthered his education at the Harare Polytechnic where he did NC Level art 2002 Newton Gwanangura was inspired by Alex Kapondoro to paint. However Newton had an interest to observe people in Colour through painting and wanted to observe their day to day activities through the nature of Art. More colour was a major interest that inspired Newton to paint. He began painting in 2001. Generally the main subject Newton ventures on is on day to day activities. i.e. woman and men at work.